Innovation and technology is at the heart of Kobelco philosophy. The manufacturer's Product Development Engineering Division and Advanced Technology Engineering Department in Japan were set up to help support the future of Kobelco construction machinery through the development of new and innovative technologies. Over the years, this support has enabled Kobelco to make huge strides forward in hybrid and electric technologies as well as develop its own unique iNDr (Integrated Noise and Dust Reduction Cooling System) technology, and innovative hydraulic systems for promoting low fuel consumption. The development of the 1.7-tonne electric-powered 17SR mini excavator concept is borne from a combination of Kobelco's expertise in developing highly efficient construction machinery for urban jobsites and Deutz's superior electric drive technology. Together, this combination will enable the electric-powered 17SR to deliver zero emissions, extremely low noise operation and reduced life cycle costs. While the electric-powered 17SR showcased at bauma is still a concept, Kobelco plans to further develop the machine in conjunction with Deutz over the next two years. The objective is to manufacture a fully electric mini excavator that will be capable of performing at the top of its class, with a long-life battery for utmost convenience. With this in mind, Kobelco expects the electric-powered 17SR to launch to the European market in 2021. 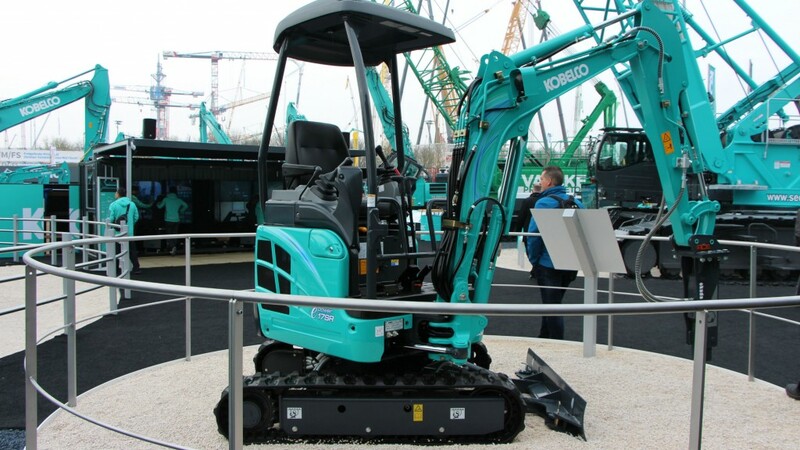 Following the arrival of the electric-powered 17SR, Kobelco's long-term objective is to further expand its machinery lineup to include more advanced technologies, including electric-driven excavators, in its pursuit of promoting a sustainable society. Commenting on the introduction of the new Kobelco electric powered 17SR, KCME Managing Director Makoto Kato said: "As an innovative and forward-thinking manufacturer, we are always looking for new ways to make our construction machinery as powerful and efficient as possible,while reducing our carbon footprint. The Kobelco Electric powered 17SR will be our first fully electric mini excavator, which we believe will be a popular choice for urban and small construction jobsites in the very near future. We are excited to launch the concept at bauma this year and are looking forward to further developing this technology with Deutz ahead of the machine's expected launch in 2021."